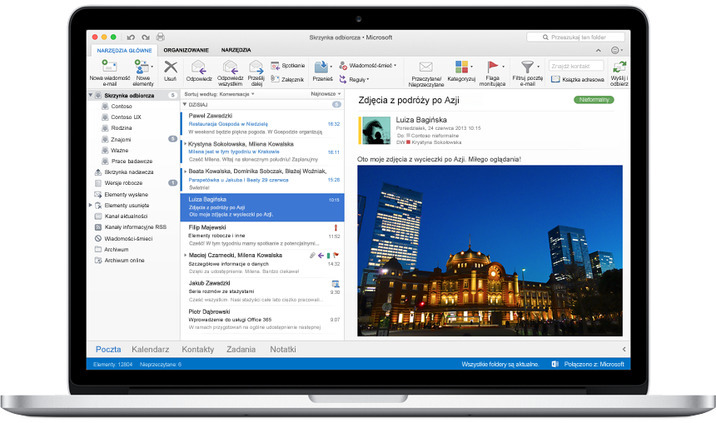 – Easy navigation between the five main Outlook elements: Mail, Calendar, People, Tasks, and Notes. – Push Mail support ensures that your inbox is always up to date. – Move messages from your inbox to an Online Archive on the server to make space in your mailbox. An online archive folder in the navigation pane provides access to your archived messages when you need them. – Propose New Time. When you receive a meeting request for a time that is not preferable, you can propose a new meeting time. The meeting organizer can easily accept or decline your proposal. – Side by Side Calendar. See multiple calendars in parallel. – Weather Forecast in Calendar. Will it be sunny or rainy? No need to look up your local weather forecast because Outlook shows the weather info right in the Calendar view. – Category Sync. Categories, including their names and colors, are now synced and the same in Outlook for Mac, Outlook for Windows, and the Outlook Web App.